Several Hamas-affiliated websites and Arab media outlets began publishing the list of Palestinian prisoners slated to be released as part of the first stage of the Shalit prisoner swap on Thursday. The full list is to be released on Sunday. 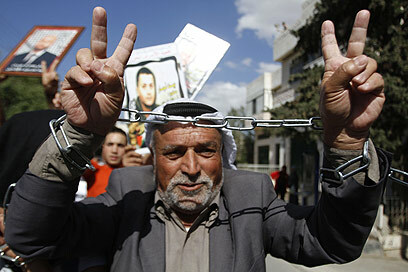 The Palestinian Maan news agency quoted a senior Palestinian official as confirming that the first stage of the deal, in which 450 prisoners would be released, is likely to take place within "10 to 14 days," while the second stage, when an additional 550 security prisoners would be released, is set to take place in two months. The official added that "Israel will choose which prisoners to release in the second phase." The list, published on the Hamas-affiliated al-Aqsa TV website, includes several top Hamas leaders, such as Yehya al-Sinwar, as well as the eldest Palestinian prisoner, Sami Younis (78). Abdel Hadi Ghanem, an Islamic Jihad terrorist responsible for the 1989 terror attack on Egged bus 405, in which 16 Israelis were killed. Fahad Schludi, a terror operative who took part in the 1993 abduction and murder of IDF soldier Yaron Chen. Bassam Abu Sneina and Riyad Asila, who are serving a life sentence for the 1998 murder of yeshiva student Haim Kerman. Nael al-Barghouthi, the longest-serving Palestinian prisoner, who was sentenced to life in prison in 1978, for murdering an Israeli security officer. Yehiya As-Sinwar, who was one of the founders of Hamas' security forces in Gaza and was involved in the abduction and murder of IDF soldier Nachshon Wachsman. He is also the brother of one of the terrorists involved in Gilad Shalit's kidnapping. Jihad Yarmur, who was convicted of Nachshon Wachsman's murder. Amna Muna, who in 2001 lured 16-year-old Ophir Rachum to Ramallah where he was shot to death by terrorists. Ahlam Tamimi, who orchestrated the 2001 bombing of the Sbarro restaurant in Jerusalem. Ahmed Najar, former head of the Silwad terror cell, which killed three Israelis in six shooting attacks during the al-Aqsa Intifada. Mohammed Hamada, who was convicted of planning a rocket attack on Teddy Stadium in Jerusalem. Ruhi Musteha, a senior operative with Hamas' military wing. Husam Badran, the former head of Hamas' military wing in the West Bank, who orchestrated the deadly terror attacks at the Tel Aviv Dolphinarium in 2001, at the Park Hotel in Netanya in 2002 and at the Sbarro restaurant in Jerusalem in 2001. Muhammad Duglas, who was implicated in the Sbarro attack, and is serving 15 consecutive life sentences for the murder of 19 Israelis. Tariq Hassin, an Islamic Jihad operative who carried out a terror attack on Highway six, killing a seven-year-old girl. Iyad Abu Hizran, a terror operative convicted of a 1991 murder of a 76-year-old Israeli man. Iyad Abiyat, an operative of the al-Aqsa Martyrs' Brigades, Fatah's military wing, who was implicated in two shooting attacks in 2000 and 2002. The list also includes the names of the six Israeli-Arabs slated to be release: Ali Amira, Muhammad Jabarin, Muhammad Ziada, Wahem Amisha, and Mukhales Braal. Some of the Palestinian prisoners included in the swap deal will be released to Turkey and other third countries, according to Turkish Daily Radikal. According to the Radikal, some 40 prisoners, who were not allowed to return to the West Bank, will be transferred to Turkey and other countries. The Daily Hurriyet claimed that Israel had refused to allow these prisoners be exiled to Syria, Lebanon or Egypt. Earlier, Prime Minster Benjamin Netanyahu thanked Egyptian Defense Minister Mohammed Hussein Tantawi for Cairo's part his securing the prisoner swap. Netanyahu praised Tantawi for Egypt's intense efforts in the case, saying: "Your assistance warms the hearts of all Israeli citizens." Hamas Politburo Chief Khaled Mashaal reportedly arrived in Cairo on Thursday, for a meeting with Egyptian Intelligence Minister Murad Muwafi. Egypt's State-run news agency reported that Mashaal, accompanied by a Hamas delegation, discussed the best way to implement the deal. "We thank Egypt for brokering these difficult talks," Mashaal told MENA. Also on Thursday, the International Red Cross offered to play a neutral intermediary role in the prisoner exchange. "We are talking to both sides about our offer. We have offered our services as a neutral intermediary to both sides," Red Cross Spokesman Marcal Izard said. See all talkbacks "Names of prisoners in Shalit deal trickle through Arab media"